Ollie’s will be open at 10am on all public school holidays and will resume full day operations once public school lets out for the summer. Come to Ollie Koala's Backyard for some family fun, and some great food and drinks! 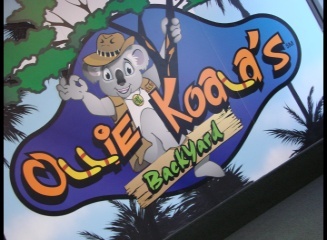 Ollie Koala's has an indoor play structure, bumper cars, air hockey, and tons of arcade games to play. The food here was surprisingly great. I had a grilled vegetable panini, and a fruit cup, Bryan had a personal pepperoni pizza and a blue slush. Free refills on the fountain drinks. I noticed that they had a salad bar, which is all you can eat on Sundays for only $5.49. I also noticed that they had beer on tap for the adults! They have free Wi-Fi too, so bring your laptops and surf while the kids have a blast playing! There were many separate dining sections to accommodate multiple simultaneous birthday parties. I really liked the security feature at the beginning. Each member of your party gets stamped with an identical invisible number upon entry. Everyone who exits, gets their hand scanned by a black light to reveal the identical number, so every child exiting will always only leave with their own parent. Bryan had lots of fun,and got lots of exercise in the play structure. At the end he redeemed his tickets earned playing the games, in Pop's Garage, which was full of cute toys and prizes. This is a great indoor family fun thing to do with the ones you love!